So you or your kid(s) got bored while sitting on your computer and browsing internet. There are lots of ways to turn your boring time into fresh and recreation time. One of those ways is to play games online. If we talk about online games, there are lots of websites that let you play games online for free of the various types but what if you're in a hurry and don't want to search for a game or any other reason! Step-1: First of all, you've to do is to open youtube on any of your browser, If you already have opened youtube then jump to the second step and see what to do more. Step-2: In youtube, you've to simply search for a video, it may be anything or any type of video. Just write something in the youtube search box and hit search button. Step-3: Once you searched for a video so click on any of the video from the results. Step-4: When you click on a result the video will start loading so when you see that the video is loading just press and hold down an arrow key from your keyboard so a snake game will pop up on the video player of youtube and you will be able to play the snake game on youtube. Don't make the snake to touch the edge of the video player because the game will end if the snake touches the edges of the player. 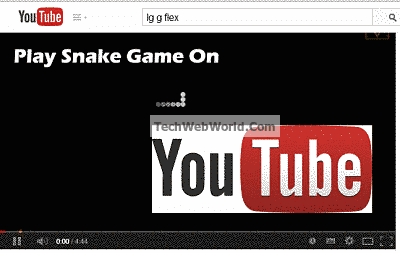 That's it, so in the above post we shown a trick that is to play a snake game on youtube. I hope you liked this post. As this in not a new trick but still if you wasn't aware of this then try it now and then share it with your friends too!